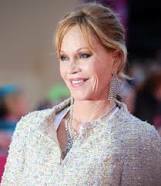 Melanie Griffith (born August 9, 1957 - zodiac sign Leo) is an American actress. She was nominated for an Academy Award and won a Golden Globe for her performance in the film Working Girl (1988). She is the daughter of actress Tippi Hedren , and the soon to be ex-wife of actor Antonio Banderas.